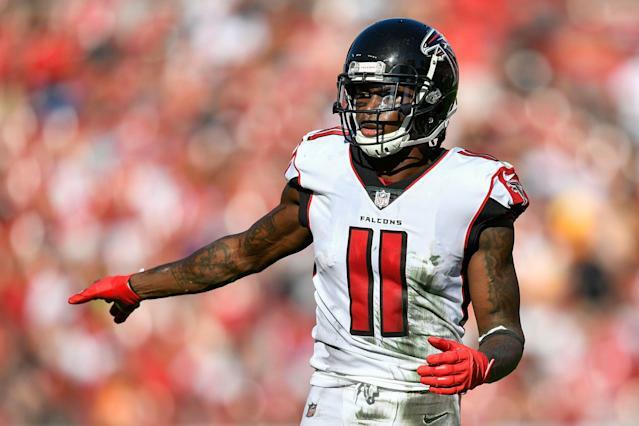 Atlanta Falcons wide receiver Julio Jones is in search of a new contract, so he will take the “optional” in “optional team activities” literally. The six-time Pro Bowler was not at the first day of OTAs on Monday, according to a report from ESPN, although the Falcons are not concerned because he is expected to rejoin the team for mandatory workouts in June. Jones did not show up for last year’s optional workouts as well because he thought he was worth more than he was scheduled to make. A few months later, the Falcons increased his 2018 salary by $2.9 million, and Jones did not miss any of training camp. So will this strategy work again as Jones sits out more offseason workouts? That remains to be seen. Jones has two years left on his five-year, $71 million deal, although he's only scheduled to make $9.6 million — a $3.8 million pay cut from last year. Jones has already said that he doesn’t need to be the highest-paid wide receiver, but there’s certainly a middle ground here. As a reference point, new Oakland Raider Antonio Brown recently landed a three-year, $50 million contract with $30 million in guarantees. Even though he just turned 30, Jones is coming off a year in which he led the league with 1,677 receiving yards, and he hasn't pulled in fewer than 1,400 yards since his injury-shortened 2013 campaign. The Falcons may need to figure out contracts for free agents Grady Jarrett (who has been franchise tagged) and Deion Jones first, but it’s hard to imagine them leaving their star receiver hanging going into the training camp.